In the building trade the word finishes refers to aspects of the structure that remain visible once construction is completed. For months and months everything that you see at a construction site: steel, pipes, wires, formwork, etc will become invisible as the structure “matures” and gets a cosmetic makeover. As a client of a builder it’s very exciting to see the start of finishing elements such as plastered walls etc because then you know there’s light at the end of the $ tunnel. One trend in finishing a building is to leave certain rough elements such as brick work uncovered. We are going to experiment a bit and have some painted brick in a stairway, for example. And our ceilings will not have gypsum board: just smooth concrete. The brick and plastering team works as a unit, similar to the building crew. The mezzanine level support column is almost in the middle of the photo. To the left will be a staircase. A king bed and small bathroom will be upstairs, and a king bed, mini kitchen, and full bathroom will be downstairs. Each unit should comfortably fit four adults or a medium-to-large family. Hope to see you in early 2019. Let’s be realistic for a moment: to lie is to be human. From our earliest days of playing in the sand, we tell stories with partial or metaphorical truths. In the case of building a house, we need to tell a story to the government about how the house will be used. And then the government will tell us whether the uses we have in mind are acceptable or not. Since lying is such a core element of who we are, different governments have different approaches to resolving matters of deception among it’s citizens. In the USA there is a massive number of building inspections (at very high costs). Your ability to cover up something (cheap wiring, etc) is obviously very limited. However, converting a legitimate storage room that happens to have good lighting into a bedroom, after the inspections are over, is not really preventable. In Indonesia the approach is remarkably different. From my understanding there are only two inspections: the first is when you have completed the foundation; the second is when it’s done. The in-house consulting office of the building department is very aware that all sorts of deceptive practices may happen, and what’s amazing is they are willing to help you submit the deception in order to get it approved. This may sound radical, but I would argue that the Indonesians have a deep understanding of human nature. Let’s take one example. A roof cannot be a livable space. 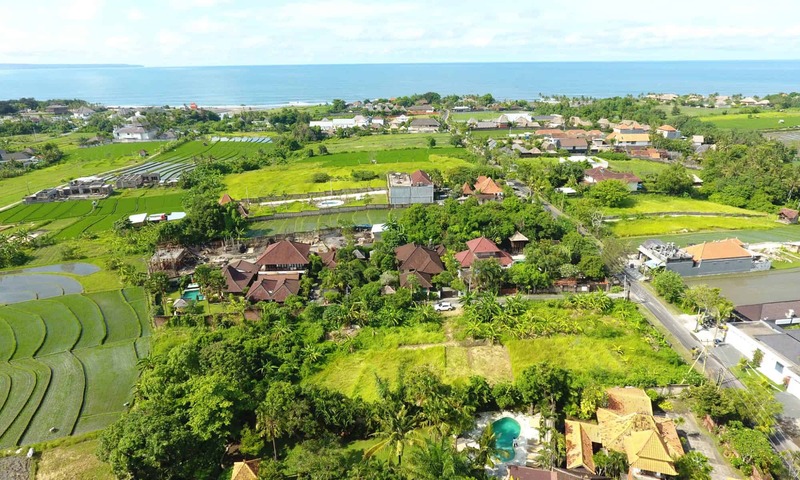 But there’s a requirement that only 60% of the top of a building structure needs to be covered by a Balinese-style roof. In my case I’d like to use the uncovered part (40%) for a rooftop bar, in order to offer drinks and sunset views of the ocean. AND I want to comply with the government and NOT use the space as livable space. So except for maybe a drunken nap, you can’t sleep on my rooftop level. It would seem that both my interests and that of the government are aligned perfectly. We tested the hypothesis by placing a small pergola on the 40% side of the rooftop level, but the government didn’t like it. Perhaps their use of livable seems to include mingling around, in addition to sleeping. Above: An X placed across the pergola and the staircase to the rooftop by a government official. However, the government consultant knows what we want and he also knows that the definition of livable is fungible. Many folks like to hang their wet laundry on the flat part of their rooftops. Should the government fine them for creating illegal, liveable spaces? Of course not. It was resolved that if we remove the staircase up to the roof, and the railings around the edge of the roof’s flat 40%, as well as place the water tank and air conditioning units in the middle of the rooftop bar (um, utility space), then the design will be approved by the government. This was a two-way process of either creating a legitimate lie or working within the bureaucratic process of seeing eye-to-eye. Wink wink we all know that mingling for a couple of hours with your mohito or hanging laundry where the sun and wind is unhindered are not permanent, liveable spaces. The government just doesn’t want you building bedrooms where you’re not supposed to have them. We are moving into a world where we are going to use smart machines that will increasingly be programmed to control our ability to deceive each other. As parents we tell our kids not to lie, and so perhaps these artificially controlled machines will become our robotic parents. In China today there’s a school that’s using cameras and facial recognition systems to determine if students are drowsy. The teacher never has to ask the student if she’s paying attention, and as the accuracy of the system increases, the little white lies that have been keeping us human are going to be deleted. In other words, a world without lies is inhuman!